Home › Daiichi News › Pike Dances a Daiichi Jig! Pike Dances a Daiichi Jig! Take a look at our new 4640 jig hook!. Here’s another one! 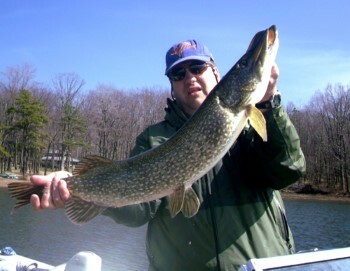 Pat Saloky wrote us: I was recently fishing for panfish. This large pike hit and I caught it on Daiichi size 8 jig hook. These seem to be very strong jig hooks and they stay sharp longer than other jig hooks I have tried.